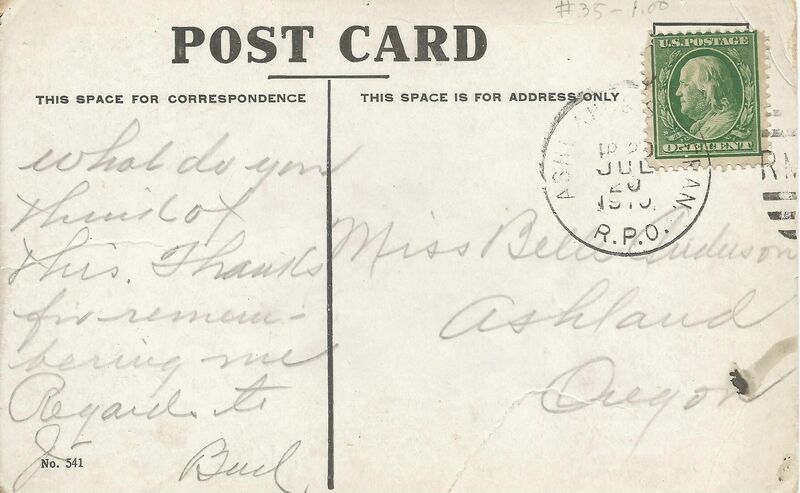 Edna sent a postcard to Nellie and Minnie. March 24, 1910. This must be a forgery, because it's written so a person could read it. I don't think they wrote legibly back then. Ha, too right. Thankfully a person with good penmanship occasionally falls through the cracks. 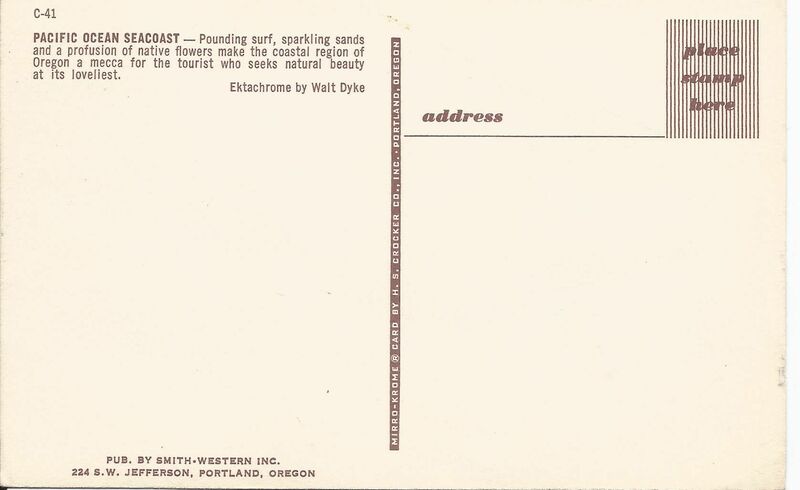 Finally, another restaurant postcard. These are among my favorites because it's interesting to see if the places are still there or not. Also if the establishments (if still there) have changed their appearance or not. 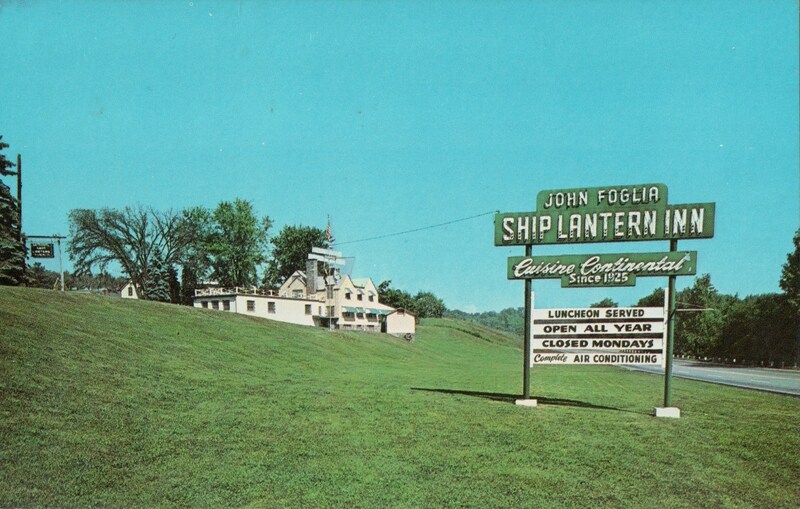 In this case we have The Ship Lantern Inn at Milton, New York. What a beautiful building. There looks to be an old colonial style house on the far side with an extended dining area to the back. 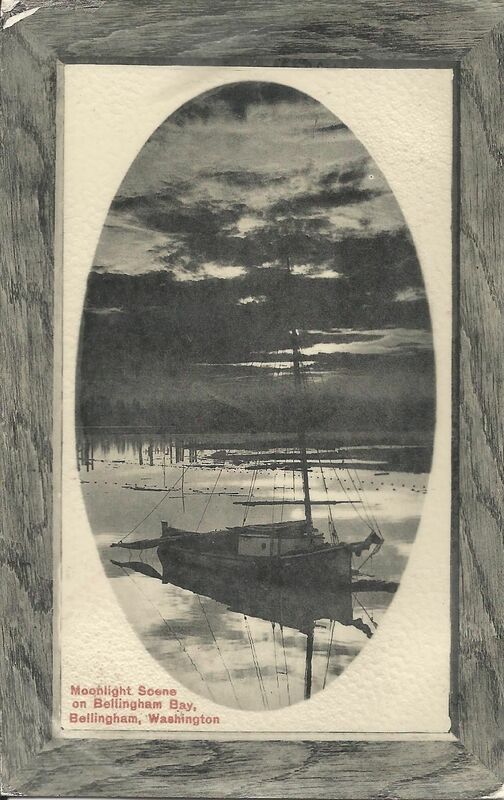 This is an unused postcard so no message but the back is very interesting because it shows a ship's model with a note that the restaurant houses the finest collection of miniature ships in the USA. 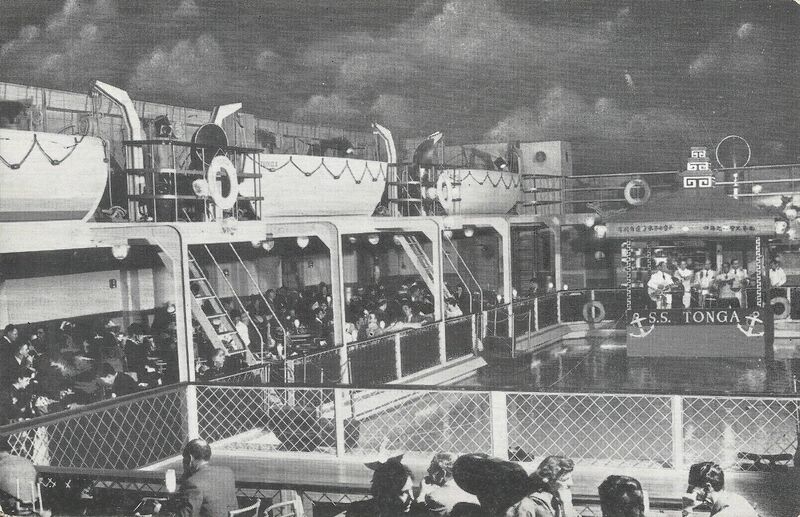 It also shows an illustration of the U.S.S. Enterprise ship model. Cool looking place but is it still there? Yes, and going by it's website, it appears that the house part hasn't changed much at all. The back dining area seems different though. There is also an outdoor dining area too that is not visible in the postcard. In closing, I should note that a present day order of 'Fresh Thick Cut Veal Shanks Slowly Braised in Pinot Noir, Veal Stock, Vidalia Onions, Leeks, Shallots, and Fine Herbs' would set us back $37.50. Given the same quality, which to collectors prefer - a used postcard (stamp still attached and all that), or unused? Also, are these from your collection, items found on linked on the internet, or recent acquisitions? What do you take me for, some kind of Deltiologist or something? Crazy, huh?..there is actually a word for people who collect postcards. I will still purchase a postcard every so often but not like I once did in the past. Years ago, I found myself collecting all types of photographic paper collectables like stereo-views, World War One pics, signed photos from the entertainment industry, German Memorial cards from WWI and for awhile, postcards. I collected enough of them to fill a 6 by 11 inch storage box and they are the ones that I show on this thread. Funny, because when I started this thread, I thought that there would be some other BellGabbers out there that might have collected them. Perhaps there are, and they don't have a scanner? lol Anyway, for those who would like to join in on the thread, feel free to utilize postcards that you might locate online. Aldous posted a 'jackalope' and it was lots of fun to see. Trostol, albrecht, Evil Twin, Digital Pig, Camazotz Automat and Lt. Uhura have found stuff. Much appreciated. As far as the collectability of postcards go, I think you hit on something when you mentioned the words 'Given the same quality'. 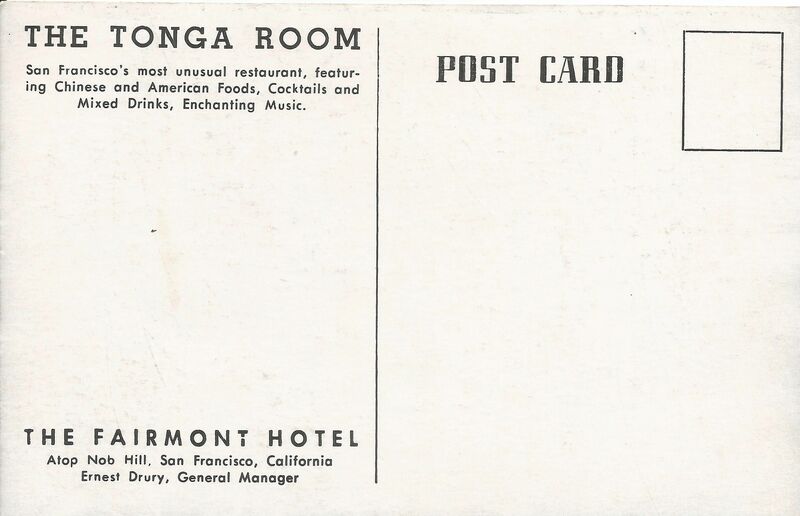 I am by no means an expert on postcards nor have I ever belonged to a Deltiology club, but I think that unused postcards are more valuable than used ones because they are cleaner and unwrinkled, unlike postcards that were sent through the postal service. The highest grade of a postcard is 'mint' and postcards can only get that term by being unused. So yeah, the blank ones are best, but I like the ones with stamps and messages on them. They convey a sense of history as seen not through famous people's eyes, but through the eyes of everyday people who lived from the early 1900's on up to the 1960's. Thanks for the great questions, PB. Another World War One real-photo postcard. This one shows some French soldiers passing by a burned out house at Chateau Thierry. Unused and undated. Shocking! At least for the early 1900's I guess. Notice the plain round cancellation mark on the back? I think it's from an uncarved cork. That's what lots of postmasters used to cancel out the stamps with back then. Was going through an old box of postcards mainly to my Grandpa and then to both my Grandparents. Unfortunately many of them were damaged at some point by water, silverfish, or just being stored in various places. 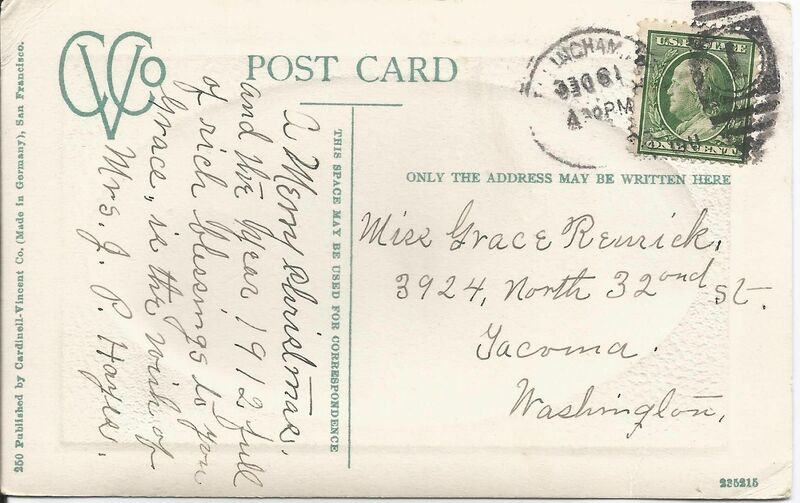 What is interesting is many of the older post cards were from one his other brothers (older by a decade or so) and feature (what now) are mundane things: The Armory building in some city, a bridge over a river, a 10 story bank building in some random city, a "grand" hotel in some Midwestern "metropolis," even, as included below, random pictures of busy streets. But being a boy on a farm in the middle of nowhere Midwest and dirt poor I imagine he derived much pleasure from looking at the life "in the big city" and the wonders of the modern world- as did many others I guess since they made postcards for what now we would just shrug. 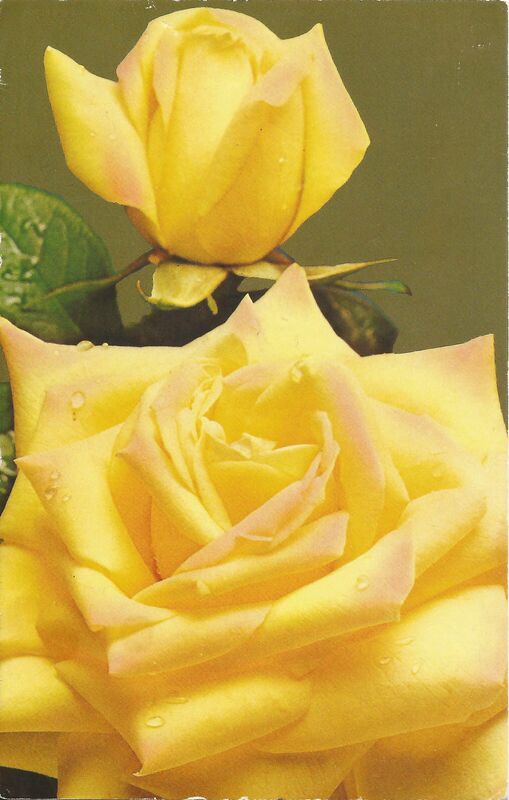 ps: the yellowed effect is a result of me using my phone to take photo of cards, I don't have a scanner. 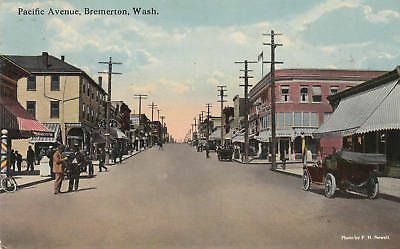 The odd thing about the Bremerton photo is the there are no wires on the telephone/telegraph poles and I can't quite figure out if it is a photograph or a painting- or a 'touched up' 'colorized' photograph? I'd guess that has to be hand-tinted, nice job of it, too. Love the Leif Erikson one! Weird about the wires. I suspect they took them out as unsightly -- a lot of old pics you can tell they fixed things up, especially where glare washed out some detail. 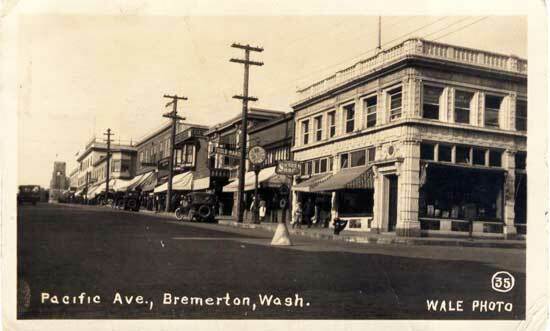 ps: did you find a copy of that Bremerton postcard or have some way to eliminate the yellow-color made by my phone? Yep a rare case of nutters being proved right for once! I found the postcard on somebody's pinterest. 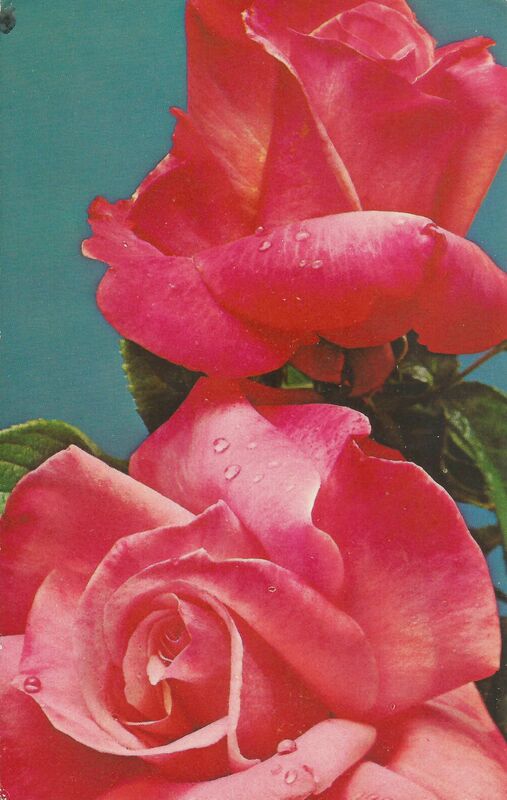 Also, now that roses are in full bloom, here are those two rose postcards from the J&P Company that I posted early on. They are unused but there is a 1970 date on back of them. Very old rose outfit. They go back to the turn of the century. That mail order place Harry and David used to sell them but not anymore. You can still buy J&P roses on-line though. 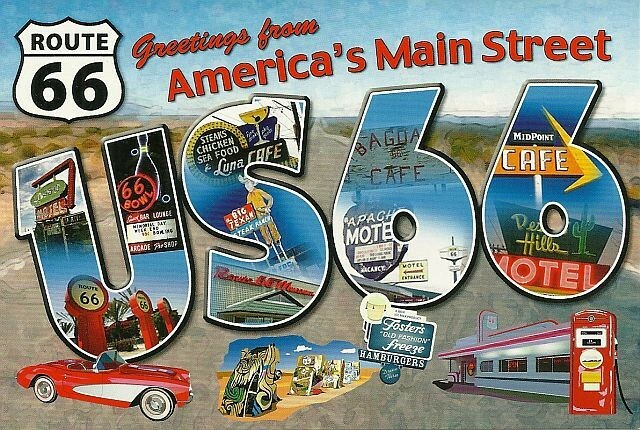 Ahhh, good old Route 66. I would love to travel the length of it before I die. A guy named Justin Scarred is doing just that, on YouTube. Thanks, trostol. Even better in some ways. You can enjoy the scenery, be the navigator (force stops for any weird roadside "attraction" (tourist traps,) firework stops, bar stops, national park stops, and imbibe, nap, or control the radio dial! Without fear of a ticket, accident, or missing scenery because needing to keep your eyes on the road. 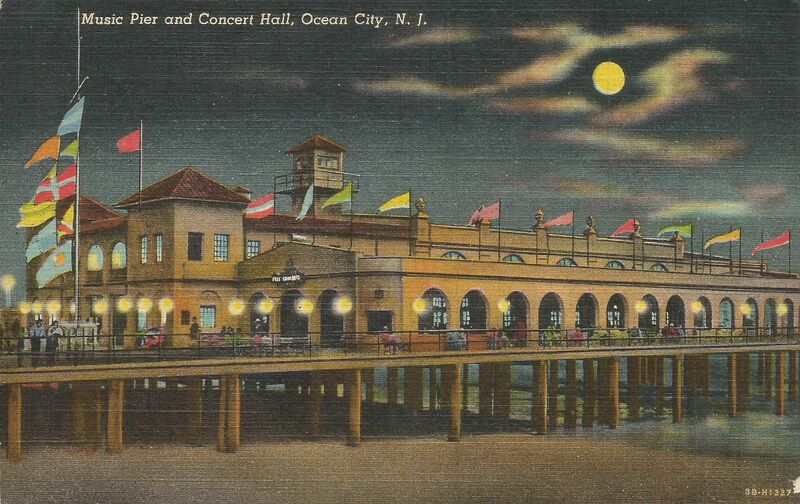 Here is a colorful postcard of the music pier and concert hall at Ocean City, New Jersey. The place is still there according to this website: http://www.ocnj.us/music-pier/. Its been around since 1928. The modern pic below shows that things haven't changed very much over the years. 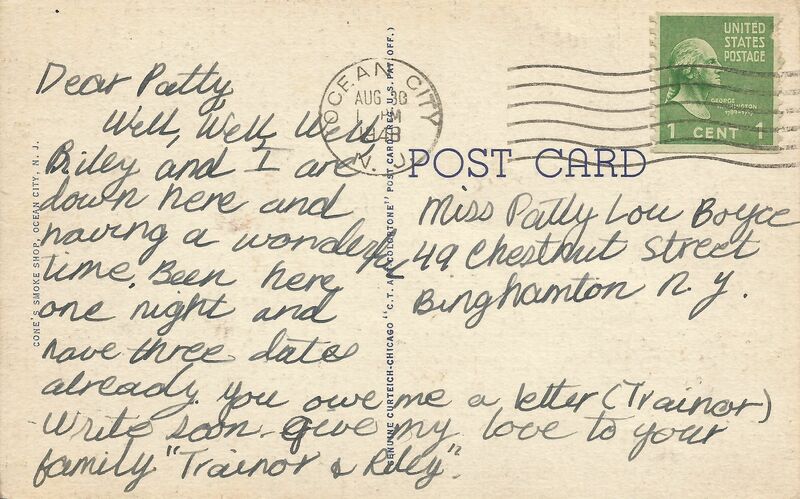 That's a 1948 postmark on the back of the card. The one cent stamp used to mail the card was printed in 1938. Great find! Especially since old stuff. I like the term "bride-elect." Ha! My mobile and picture quality couldn't see what records being selected, alas. Thanks. I thought I would look her up as an afterthought, not really expecting anything. I can't see the record labels either. Probably Frank Sinatra? Inspired, maybe, by the formidable Daughter-In-Law-Elect in the Mikado? The relevant part starts at 1:10. Ha, that was cool, K. I really like that Daughter-In-Law-Elect. I'm glad you liked, Rix; I think she's what used to be known as a battle-axe. If memory serves, she doesn't ascend to that position and is married off to the Lord High Executioner. I picked this postcard to post because of the nice, serene scene on the front of it. A small boat gently floating on a bay. Then I looked at the stamp cancellation for a date. I could make out December, but no year, so I checked out the stamp production date...a one cent green Franklin, printed in 1910 and 1911. Check. Then I read the message, only to find out that I could have saved myself some time in looking up those other items.. It was a Christmas card. "A Merry Christmas and New Year 1912." Oh well, I'll post it anyway. It is a nice, moonlight scene. 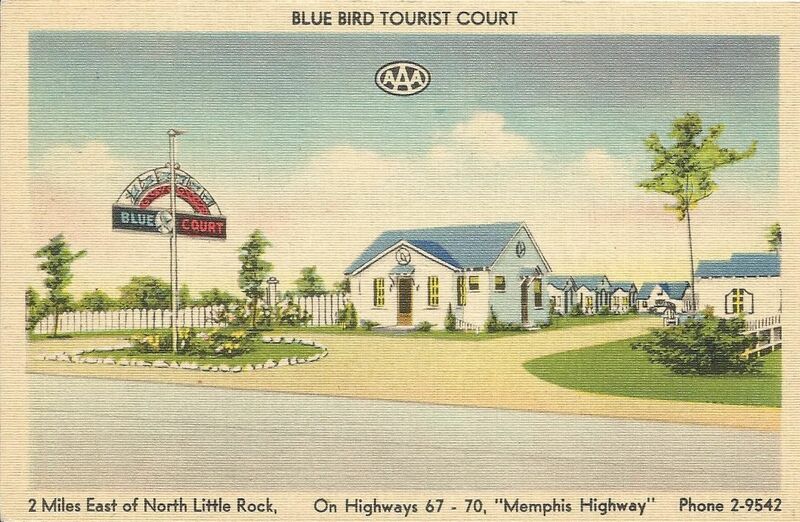 Here is another look at the Blue Bird Tourist Court. I don't believe the place is around anymore. Ciardelo had a vague memory of the place when his family was headed out west. One thing I missed the first time I posted it was that the AAA logo on top of the card differs from similar cards I have seen online. The logo is on the upper left hand corner on those postcards. This would become a familiar sight in Army training centers throughout the United States. This postcard shows a bunch of soldiers watching something...what, I don't know because there is absolutely nothing on the back of the card in the way of an explanation. I would normally take this as just being a photograph but it is the size of a postcard. Plenty of room for a stamp and a message on the back. The soldiers are watching something, that's for sure. An instructional display of some type perhaps, or possibly even an impromptu sporting event? It's a rather non-formal affair...notice the kids and some ladies mixed in with the soldiers? 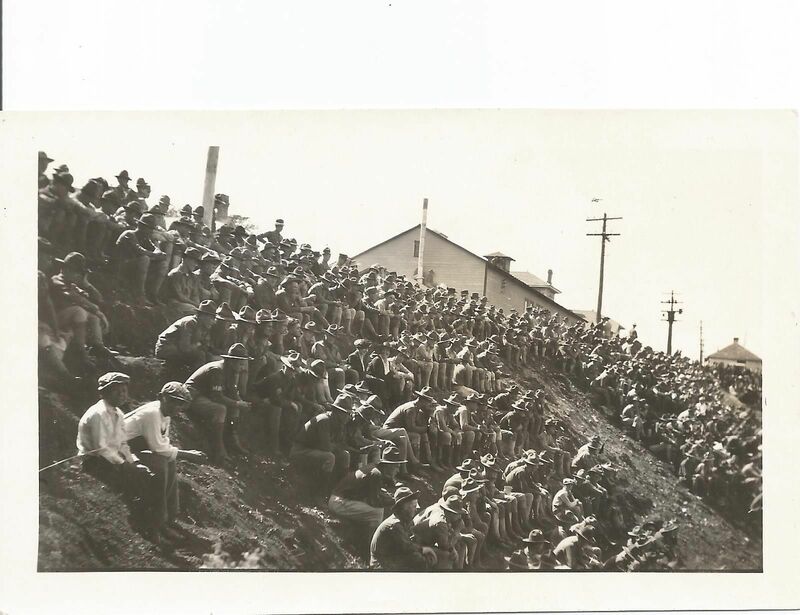 The men's uniforms and the dirt filled hillside makes me think that that this is a fairly new camp, possibly constructed in the summer of 1917. We could use something colorful after that back and white postcard. 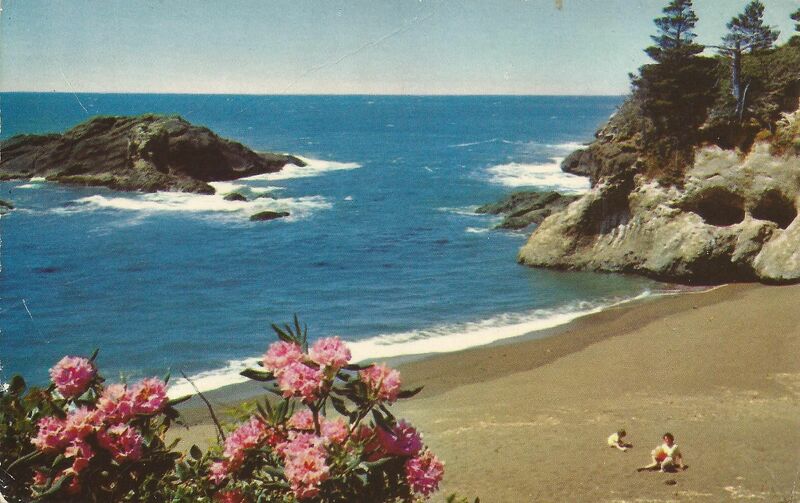 Here is the Oregon beach postcard that was displayed early on in this thread. The photographer, Mr. Walt Dyke, was actually given credit for the pic. Turns out that you can still see his work online, here and there. Look at that rock cave to the right. I see two eyes, a crooked nose and somewhat of a mouth on it. A photo by Walt Dyke from the State Library Photograph Collection, 1851-1990, Washington State Archives, Digital Archives, http://www.digitalarchives.wa.gov, 04/04/2014. I see the "skull rock" also. Last post card, which for some reason isn't showing up on my reply, is Manito Park in Spokane. Olmstead Brothers designed and still around and maintained and been there many times. That was a photo attachment. Here it is again. You should be able to see it now. Wow, that Manito Park is a pretty cool looking place.